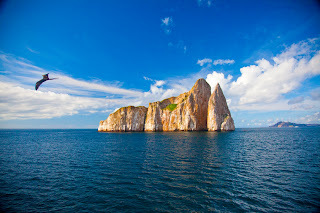 One of the most photographed sites in all of the Galapagos Islands is Kicker Rock, also known as Leon Dormido because to some it resembles a sleeping lion. 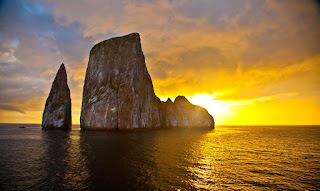 Kicker Rock is an easy trip from San Cristobal’s harbor of Puerto Baquerizo Moreno and no excursion to the Galapagos Islands is complete without a visit here. 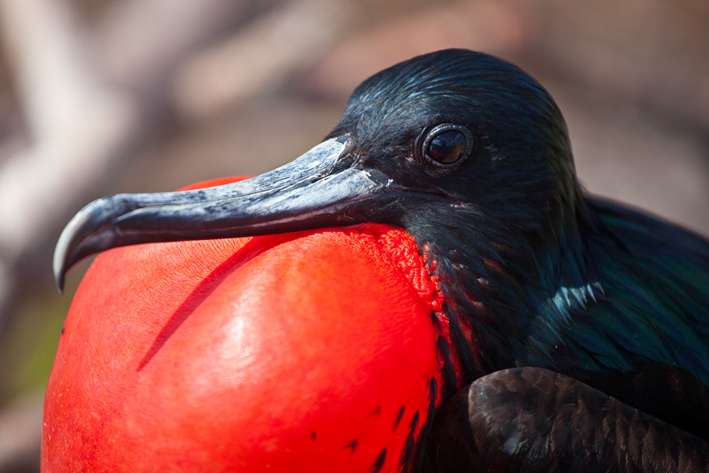 There is no more stunning and majestic site in the Galapagos Islands. 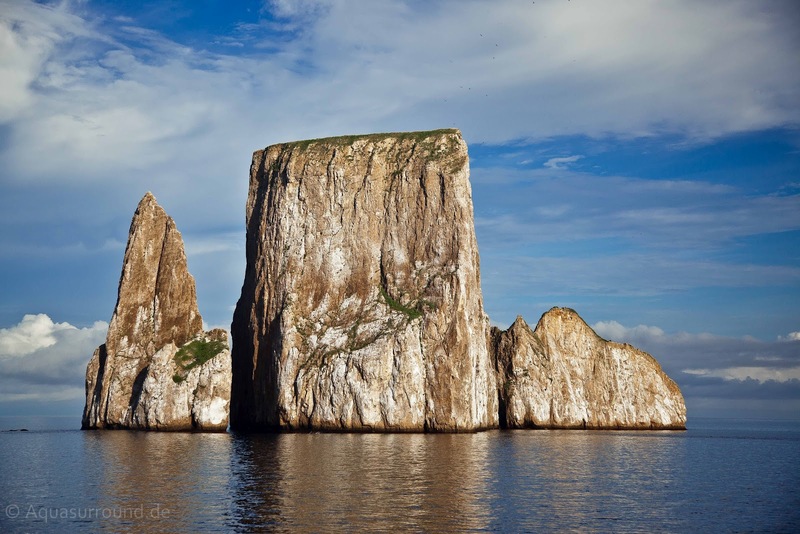 The two inexorable towering monoliths of Kicker Rock are a constant presence within an environment that is otherwise ever-changing and dynamic. Approaching Kicker Rock, you may at first see only one large rock inexplicably rising from the Pacific. As the boat gets closer, you begin to see that there are, in fact, two high peaks and soon you can discern a space between them. If it is daytime, the blue sky, white clouds and sun will dazzle you. At sunrise and sunset, the sun may peak between the two peaks, or it may diffuse the sky with the most gorgeous colors and light. The rock faces themselves tell a story of evolution. You might imagine the millions of years it took for underwater volcanic action to result in a lava build up that created this natural wonder. But, you might equally imagine and be fascinated by the erosion caused by the water and wind that is just as inevitably wearing down these towers until, some day, they will again be covered by the sea. What a stunning story. The birds and marine life that you see from the boat tell another story altogether. 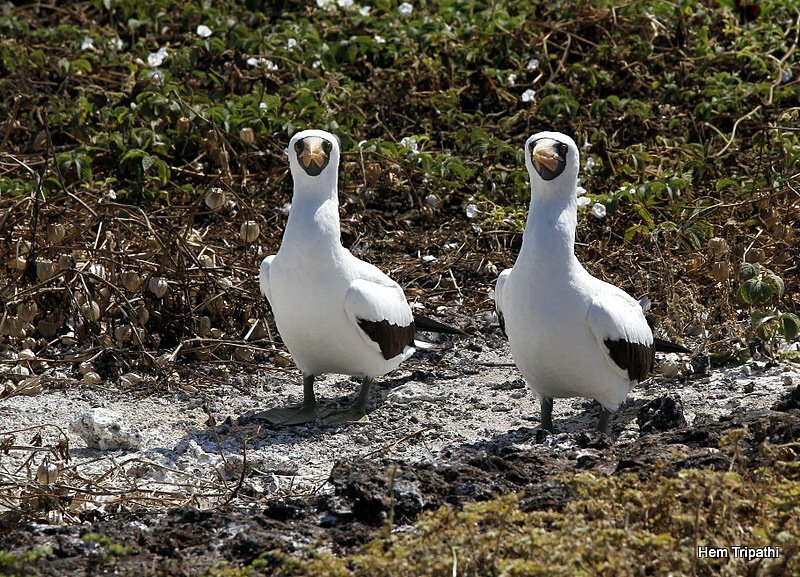 Kicker Rock is a haven for frigate birds. Nesting in the trees and scrubs within the crevasses of the rock face are Nazca boobies. And that’s just what you can see from your boat. The amazing underwater activity at Kicker Rock is, if anything, even more stimulating and creates a perfect spot for snorkeling or even SCUBA diving. Here, I frequently see both hammerhead and Galapagos sharks and many schools of fish. We can swim close to the rock face and hope to see angelfish, eagle rays, starfish, sturgeon and rainbow fish. You might even see a penguin or the Galapagos tortoise swimming by. 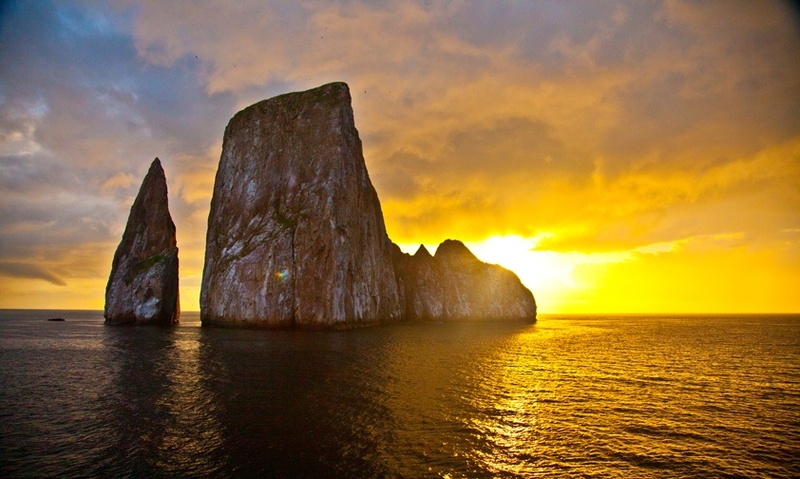 There is no more stunning and majestic site in the Galapagos Islands than Kicker Rock. You will be captivated by this site of an old volcanic eruption now eroded by tens of thousands of years of wind and waves.